As part of our celebration of Pride Month, I want to talk about a few LGBT artists who have inspired me and continue to be a source of strength. Today I turn to Mexican artist, Frida Kahlo. At an early age Frida was stricken with polio, and it left her right leg shorter and thinner than her left. It also caused her to be isolated from her peers and be bullied by them. She became quiet and introverted as a result. It wasn’t until she was college age that she began exploring her artistic side, and even then it wasn’t until after her death that her art was fully appreciated. She painted her reality, using bold colors and design evoking the folk art of Mexico. In her painting Two Nudes in the Forest, her love of women is vibrantly apparent. Her later work reflected her failing health and growing misery. The most famous example of this is The Broken Column. Frida was bisexual, and though she was married to fellow artist Diego Rivera, she had many affairs with both men and women in her life. 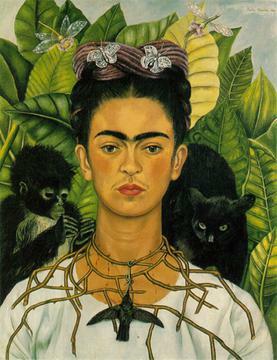 She is today considered one of Mexico’s most influential artists, as well as an icon for the underdog. She was disabled, abused, gay, gender non-conforming, and a feminist. Her face is one of the most recognized in art today, and she was way ahead of the selfie trend.